 After a six-year break the World Summit of Nobel Peace Laureates returned in Rome, the city where the official Summit organizer, the Permanent Secretariat is based and where the World Summit was born and its first 8 editions have been hosted, renewing its spirit as a meeting point of the ideals of Peace. 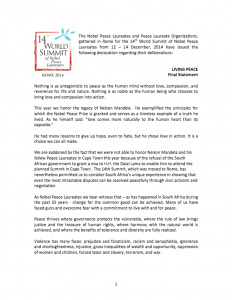 The Summit commemorated the life and work of Nelson Mandela as a global icon for peace, the man who gave his life in the name of Peace and Freedom. The man, who managed to influence entire generations through his timeless example, is still a symbol of courage and perseverance. 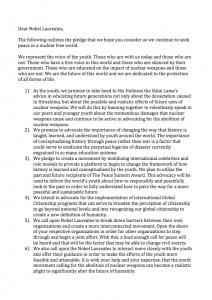 It extended a message to the many young people who watched and participated in the events of the 2014 World Summit, whether by attending the event in Rome, or viewing the international live stream over the internet: even the most difficult and intractable problems can be solved peacefully through goodwill and genuine negotiations. 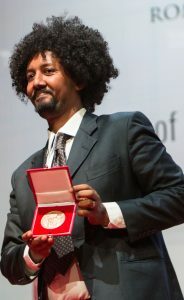 Tareke Brhane is the recipient of Peace Summit Medal for Social Activism 2014 ‘for dedicating himself to raising awareness on refugee issues in Italy, after being a refugee himself, and for creating the 3rd October Committee so that the victims will not be forgotten’. Tareke Brhane was born in Eritrea, where he studied and worked since the age of ten to sustain his mother. When he was 17 he fled from Eritrea to avoid forced military conscription for life. For Tareke to leave his country was not an easy choice and the risks he faced were numerous. His journey lasted several years and he faced death, violence and imprisonment while he was crossing Sudan and Libya. During his first attempt to cross the Mediterranean he was rejected until at the end of 2005, finally, Tareke was able to reach Sicily. Since then he has always been committed to helping those who, like him, were forced to face a dangerous journey, in order to escape from unbearable and dramatic situations with the hope of obtaining protection in Europe. Tareke worked as a cultural mediator in Lampedusa and southern Italy for Save The Children and Doctors Without Borders. Today Tareke lives in Rome where he is married and has two children, Michele and Simone. 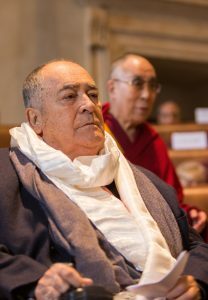 He assists asylum seekers and is president of the”3rd October Committee”, a non profit organization founded in the aftermath of the tragedy in Lampedusa in which 368 persons lost their lives. The aim of the organization is to obtain recognition of a Day of Remembrance to be celebrated every 3rd October at national and European level to honor all migrants who perish at sea and those who risk their lives in order to save them. The 3rd October Committee believes that a Day of Remembrance will provide an opportunity to discuss the phenomenon of migration and forced migration, involving local communities, schools and civil society in order to spread awareness on the massacre occurring in the Mediterranean and promote a culture of hospitality and human rights. Over 20,000 migrants and refugees have died while trying to reach safety in Europe in the last 20 years. The shipwreck off Lampedusa in 2013 is only one of the many disasters which have occurred, although for the first time hundreds and hundreds of bodies were recovered from the sea and captured the world’s attention. The 3rd October Committee has been striving to obtain dignity for those and other bodies of migrants recovered at sea, representing families in their request for clear and immediate identification procedures.